Beautiful nails in an instant! Packaged in Mexico with parts from: Nails - China/Mexico, Buffer - China. 1. Clean and buff nail lightly. 2. 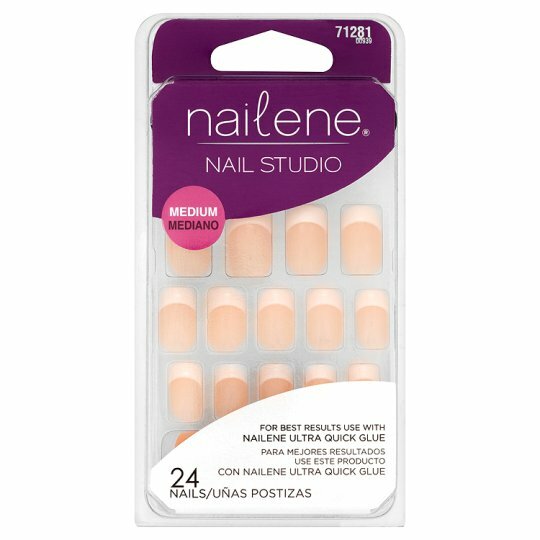 Apply Nailene's nail glue for easiest application and longest wear (See A). 3. Press and hold (See B). To Remove: Trim and file artificial nail. Soak in acetone polish remover until artificial nails dissolve. Do not break or peel off nails. Wear beyond 7 days is not recommended. CAUTION: Do not use if nail is inflamed or infected. KEEP OUT OF REACH OF CHILDREN.